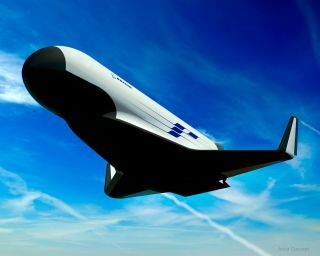 This artist's concept art depicts one possible Boeing design for the U.S. Military's XS-1 Experimental Spaceplane concept. This story was updated at 12:25 a.m. EDT Saturday. Three companies have gotten more money to continue developing their concepts for the United States military's XS-1 robotic space plane. The Defense Advanced Research Projects Agency (DARPA) awarded Boeing and Northrop Grumman $6.5 million each for work under "Phase 1B" of the XS-1 space plane program. The third company, Masten Space Systems, presumably got a similar amount. The additional $6.5 million will allow Boeing to "continue the development of the XS-1 demonstration concept, substantiating identified core component technologies, mitigating risk, developing a Technology Maturation Plan (TMP), and performing several demonstration tasks," Boeing's contract modification states. Completion of these tasks is expected by August 2016. DARPA wants the reusable XS-1 — short for Experimental Spaceplane-1 — to make it easier and cheaper to get satellites to orbit. Eventually, the unmanned vehicle should be able to fly 10 times in a 10-day span and launch 3,000- to 5,000-lb. (1,361 to 2,268 kilograms) payloads for less than $5 million per mission, agency officials have said. "Northrop Grumman is focusing on the core DARPA hard parts of XS-1 — 10 launches in 10 days and bringing payloads to LEO [low-Earth orbit]," Doug Young, vice president of Space Systems Resiliency at Northrop Grumman, said in a statement provided to Space.com. "This is the forcing function to achieve the rapid launch capabilities needed for resiliency," Young added. "This kind of reliable space access is critical for many defense needs, and something we must have as space becomes more contested. The $6.5 million award we received from DARPA for the Phase 1B study will allow us to advance some really unique ideas for making this strategic requirement a reality." The XS-1 will likely feature a reusable first stage and one or more expendable upper stages. The first stage will fly to suborbital space and then return to Earth, while the upper stage(s) will deploy the space plane's payloads. The first XS-1 orbital mission could take place as early as 2018, DARPA officials have said. For the Phase 1 work, Boeing teamed up with Jeff Bezos' aerospace company, called Blue Origin; Northrop Grumman partnered with Virgin Galactic and Masten cooperated with XCOR Aerospace. Boeing already has experience building robotic space planes for the U.S. military. The company constructed the Air Force's two X-37B space planes, which have launched on a total of four mystery missions over the past five years. The XS-1 isn't DARPA's only attempt to make spaceflight cheaper and more efficient. The agency also runs a program called ALASA (Airborne Launch Assist Space Access), which is developing a system to launch small satellites from the belly of an F-15 fighter jet. The first in-air ALASA test could occur later this year, DARPA officials have said.